The annual 3-day Water Festival popularly known as Sangken begun all over Arunachal Pradesh on Saturday with traditional throwing of water on each other, on revellers and pedestrians alike, amidst euphoric enthusiasm and colour. Sangken is a celebration that embraces goodwill, love, compassion and thankfulness, using water as the means of expression. The festival is celebrated as the traditional Buddhist New Year’s Day by the Tai Khamti, Singpho and Tangsa (Tikhak) communities across the State. One of the main traditions that form part of Sangken is to pour water on each other in mirth and to celebrate the festivity. The significance of water is to wash away bad luck and start the New Year on a new note. People, young and old, dressed in their best traditional attire thronged Buddha Vihara of their respective villages at the designated time of 11:09:05 AM on April 14 and brought out the statues of Lord Buddha to be placed at the makeshift temporary shrine called Kyong fra Sangken after paying certain obeisance to the Triple Gems-the Buddha, the Dhamma and the Sangha. Thereafter, water pouring on Buddha statues which is considered as an iconic ritual of this festival was performed and will continue till the festival concludes on April 16 (Monday) at exactly 03:13:47 PM. The statues of Lord Buddha will be kept in the makeshift temporary shrine till the end of the Sangken festival celebration. After performing the traditional rituals of offering candles, flowers and the bathing of the Buddha, revellers at the Buddha viharas erupted in merriment and splashed with bucket-loads of water unto each other and people in the streets whether they are taking part in the celebration or not. Sharing of homemade sweets and dishes also form integral part of this festival. 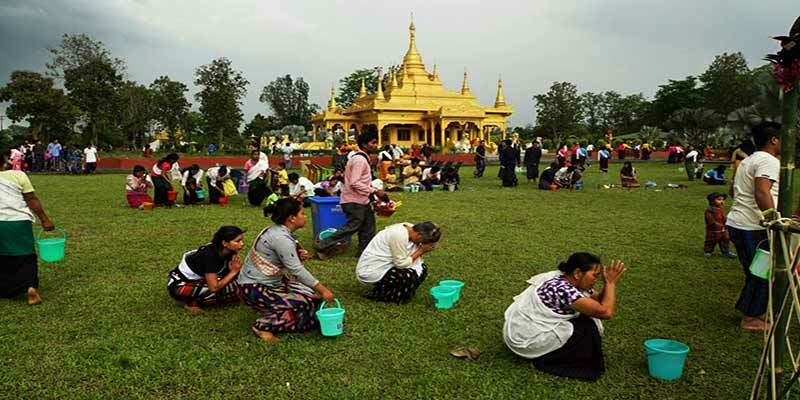 Celebrations take places across several villages but the majority of people will never fail to take part in the celebration of Kongmukham (Golden Pagoda) Tengapani, Namsai, Chongkham, Empong and Phaneng as people consider this places at Ti-met (sacred place). People from Namsai district also visit Buddha Vihara at Kalioni (Karbi Anglong), Assam which is also considered very sacred to celebrate the Sangken festival. Deputy Chief Minister Chowna Mein was accorded warm reception upon his arrival by the members of Tai Khamti Heritage and Literary Society (TKHLS). Parliamentary Secretary (Environment & Forest) Chow Tewa Mein, former MLA Namsai, Nang Sati Mein also took part in the celebration of Sangken festival at Kongmukham, Tengapani. The Deputy Chief Minster, Parliamentary Secretary (Environment & Forest) and former MLA Namsai poured scented water (son fra) on the statues of Lord Buddha and lighted candle and incense sticks to pay respect to the Triple Gems-the Buddha, the Dhamma and the Sangha. “Sangken is a festival celebrating the traditional Buddhist New Year, held in April and marked by the throwing and sprinkling of water”, Mein said. Extending his best wishes on Sangken, DCM Mein prayed that Lord Buddha shower his divine blessings and fill everyone’s life with happiness, prosperity, good health and success. He hoped that with the blessed water (Nam Metta), sorrows and pains of everyone are washed away. Mein also lauded the members of TKHLS for their efforts in creating awareness and sensitizing people and youths of various villages to play clean and safe Sangken. Parliamentary Secretary (Planning and Investment etc) Chau Zingnu Namchoom has also extended his best wishes to the people of Namsai dist for a joyous occasion of Sangken. He hoped that the showers of water (nam metta) wash away all problems and sorrows and bring along happiness and prosperity. He joined in with the people of Namsai to celebrate the water festival at Pariyatti Sasana Buddha Vihara Namsai. He participated with others in the traditional ritual of bringing out of statues of Lord Buddha from main temple to temporary makeshift shrine. He also performed the ritual of pouring scented water on the statues of Lord Buddha to invoke the blessings of Lord Buddha for peace, harmony, good luck and good health. The member of Theravada Buddhist Society dressed in their best traditional attire thronged the vihara and performed the ceremony of loung fra (bringing out statues of lord Buddha to temporary shrine), son fra (pouring of scented water to statues of Lord Buddha), sprinkling water onto monks as an auspicious act to receive blessings for the New year, merit making by offering alms to monks, and splashing water on the visitors and other people with buckets full of water.